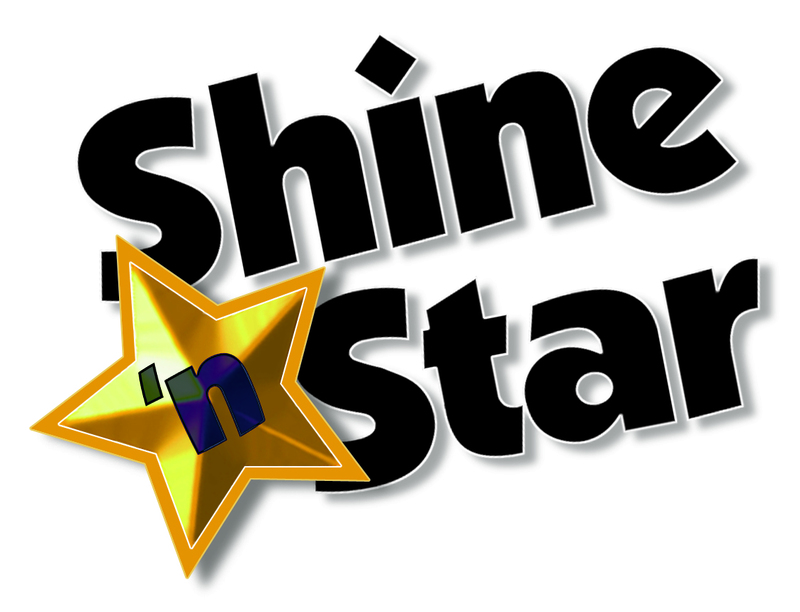 WINTER SPRINGS, FL, November 2, 2017	(Newswire.com) - Tow Times magazine and Ford Trucks announce the 2017 winners of the Shine 'n Star Tow Truck Photo Beauty Contest, an annual competition of tow truck graphics now in its 26th year. Tow Times received hundreds of entries from around the country and Canada, with the 16 winners hailing from 13 states. The good-looking trucks were selected in five different categories, ranging from light-duty, medium-duty, heavy-duty, car carrier and working truck. 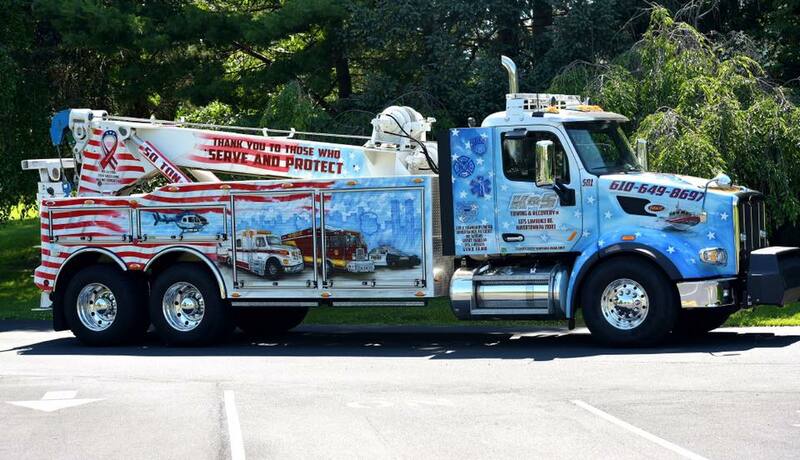 The Grand Prize winner, submitted by K&S Towing and Recovery Inc., Havertown, Pa., is a 2016 heavy-duty tow truck with a Peterbilt chassis and Jerr-Dan Corp. 50-ton JFB towing unit. People love it. We get a lot of thank yous. The annual Shine ‘n Star Tow Truck Photo Beauty Contest, which is powered by Ford Trucks, taps into towing operators’ pride in their fleet, providing an opportunity to show off the beauty and brawn of their equipment. 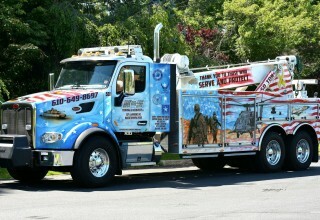 The truck is painted with patriotic, military and first responder images, and the Twin Towers – a creative job that took nine weeks to complete. The hood depicts an American eagle on an American flag. "Thank you to those who serve and protect," each side of the boom reads. "We’re all volunteer firemen and we have military ties," says Steven Fusaro, owner of the 10-year old family-owned and -operated company. 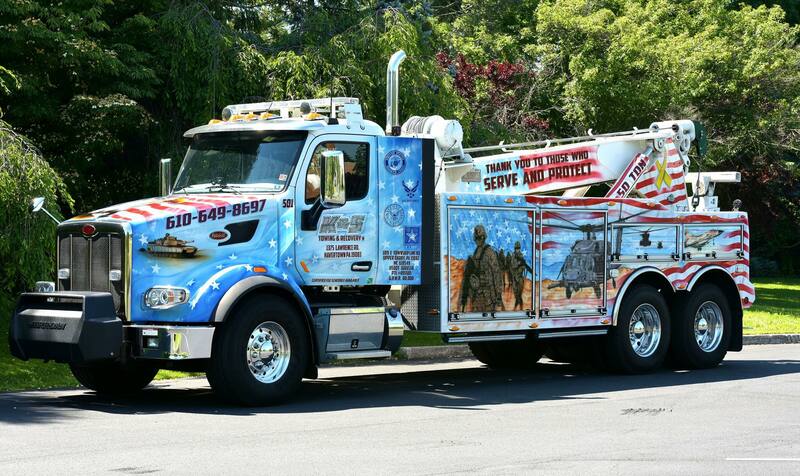 "My two brothers-in-law – John and Chris – are vets and they are the two guys painted on one side of the truck." Like many tow truck operators, Fusaro savors the compliments generated by his tow truck. "People love it. We get a lot of thank yous," he says. "We show it off in processions and parades." Fusaro's 80,000-lb. vehicle is featured in the November issue of Tow Times magazine. 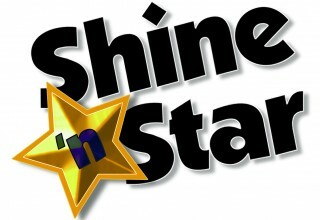 The People's Choice award winner and all First-Place winners will be profiled in upcoming issues of the magazine. Second- and Third-Place winners will be mentioned in a single issue as well. Grand Prize: K&S Towing and Recovery Inc., Havertown, Pa.
People's Choice: Sterry Street Towing, Attleboro, Mass. Light Duty: Dowhy Towing & Recovery, Kearney, Neb. Medium-Duty: A&M Towing, Locust Grove, Va. Car Carrier: All American Towing, Sioux Falls, S.D. 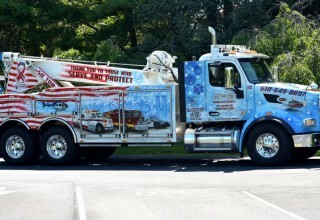 Working Truck: Bill's Auto Body of Darien Inc., Stamford, Conn.
Light Duty: Ricci & Sons Towing LLC, Rochester, N.Y. Medium-Duty: Universe Towing Inc., Bronx, N. Y. Heavy Duty: Statewide Towing Inc., Chelsea, Me. Car Carrier: Magill's Towing, Monroeville, Pa. Working Truck: Bannon & Son Wrecking, Noblesville, Ind. Light Duty: All County Towing & Auto Body, Freeport, N. Y. Medium-Duty: ABC Towing of Port St. Lucie Inc., Fort Pierce, Fla. Heavy-Duty: Big Boy's Towing & Recovery, Pacific, Mo. Car Carrier: Pauls Towing, Sewell, N. J. Working Truck: Waggy's Towing & Truck Service, Manassas, Va.
Reach Steven Fusaro of K&S Towing and Recovery Inc., Havertown, Pa., at 610-633-5649.